Reticulans understand that the Universe operates in at least eleven dimensions and that reality is mostly hidden. If they cannot liberate Earthens from their dimensional blindness, the planet is destined to be consumed by forces spreading inwards from the outer galaxies. New philosophical and technological ideas add a rich vein of meaning to this story of believable futurism flavoured with action, romance and intrigue - a meaning that may just explain, in a completely non-religious way, how the universe really works. The ideas presented in The Mystic Functions are compelling - the story a cinematic experience of the mind. The Mystic Functions has been described as “the thinking person’s science fiction” and heralds a return to the days when books left you better off for reading them as well as thoroughly entertained. Review : Not having read any of Skewes'' work before I was a little cautious, not only as there are only so many hours in a day but also, I hadn''t read science fiction for a long, long time and I''d figured I''d read just about all I needed to read. Wrong! 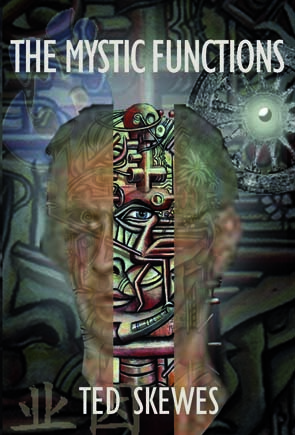 The mystic functions is more than just a good science fiction read (and it certainly is that). To me, it eloquently proposes a philosophical/spiritual premise as to why the universe behaves the way it does and how it''s inextricably linked to the idea of cause and effect, or karma and it''s consequences. The real joy of this book though is that it''s so damn easy to read. With a gift for making complexity seem uncomplicated and concepts of some magnitude quite manageable, it''s an absolute delight! Looking forward to his next. Title : Insightful, informative and engaging read. Review : If like me you have found multiple dimensional theory and quantum physics hard going, and have wrestled with the Buddhist concept of nature of Mind and the fifth dimension in books such as: Sogyal Rinpoche, The Tibetan Book of Living and Dying. C.W. Leadbeater, Occult Chemistry and A Text Book of Theosophy. A.A.Attanasio, Radix, In Other Worlds, Arc of a Dream. Jay Alfred, Dark Matter, Dark Energy. Brian Green, The Fabric of the Cosmos. then Ted Skewes in his The Mystic Function brings his insight to help us laymen with new inspiration. Ted has come along with a new window into the nature of reality and I believe he has achieved as he set out to do, in his own words from the back cover: “New philosophical and technological ideas add a rich vein of meaning to this story of believable futurism flavoured with action romance and intrigue - a meaning which may explain in a completely non religious way, how the universe really works”. The Mystic Functions is an informative and pleasant read without becoming lost in verbatim. In his Karmic field theory (also named as Kefftee Philosophy) Ted Skewes simply explains through physics and philosophy the mystical functions of the Cosmic Mind by combining contemporary physics with ancient mystical philosophy. Peppered throughout the novel are circumstances and incidents which the author uses as illustrations to demonstrate the workings of karmic field theory such that the reader gets to assemble a basic simple framework in his, or her, own mind. For me the burden of something which I had been trying to fathom for many years, but did not understand, was lifted in my second reading of this book. “Karmic Field Theory takes methods and explanations from the extremes of pre-religion and post-science, examines them and accepts them on a scale of plausibility, much the same way as science now does.” Although Ted deals with some very futuristic complex concepts, he keeps it simple and avoids the ‘in-house’ language found in quantum physics. Ted makes us aware that we are in direct manipulation of our entire physical world. Our lack of awareness of this fact makes our life appear to be just ''an occurrence'' that is out of our control. It may appear to us that we are the victim of circumstance. Quantum Physics would say that we are the cause of those circumstances, including our experiencing of happiness and/or lack of it. Ted Skewes uses the conflict between the bad character Geoffrey Ross and Earth’s leaders to explain the function of Karmic field theory. Our planet produces a regular crop of tyrants but somehow they manage to self destruct. If Quantum Field Theory was a Philosophy it would be Karmic Field Theory. There are indicators within climate change research that we all are at threat of extinction. Karmic field theory may suggest that we have been poorly performing as custodians of our physical environment because of our limited comprehension of the more subtle aspects of the quantum environment. Ted’s explanations of Karmic field theory may help us be better custodians of our environment. Ted is also presenting us ordinary pedestrians with real positive hope that we are not doomed to have our personal futures linked forever to tyrants. For anyone who has the slightest education in the dynamics of quantum phenomena will know that anything is possible and what Ted proposes as the function of karmic isolation such as happened to the villain Geoffrey Ross is possible on a grand scale as a quantum event. Presently scientists have performed teleportation of simple particles and quantum computing is still in its infancy stage, but the ideas that Ted is suggesting appear to be more likely to become reality than not in the near distant future. Ted Skewes has presented a very positive version of AI that has been missing from the science fiction genre which has tended to present insightful but mostly very negative options. Given our complex future challenges we need all the help we can get in imagining and managing a positive future and Ted’s Mystic Functions does exactly that. As a fictional work for me the archetypes behind the story in The Mystic Functions fit well within historic archetypes, but Ted has renovated then to fit our present needs of contemporary society to function as effective approachable examples of real multidimensional reality. As a novel it does not have an index, but Ted Skewes has been kind enough to provide a summary of karmic field theory in the addendum, something I had often wished for when reading the works of A.A. Attanasio. Review : A mesmerizing paradoxical read. I couldn''t put it down. It is rare that I find a book that challenges, and at times, disconcertingly, absorbs my philosophical outlook. Skewes work throws down the gauntlet;· read me and re-evaluate your current schema, or don''t and go to your end knowing that you were given the opportunity to fundamentally change your life, and declined it.